Green and brown spikes rise six inches above a green rosette of leaves. 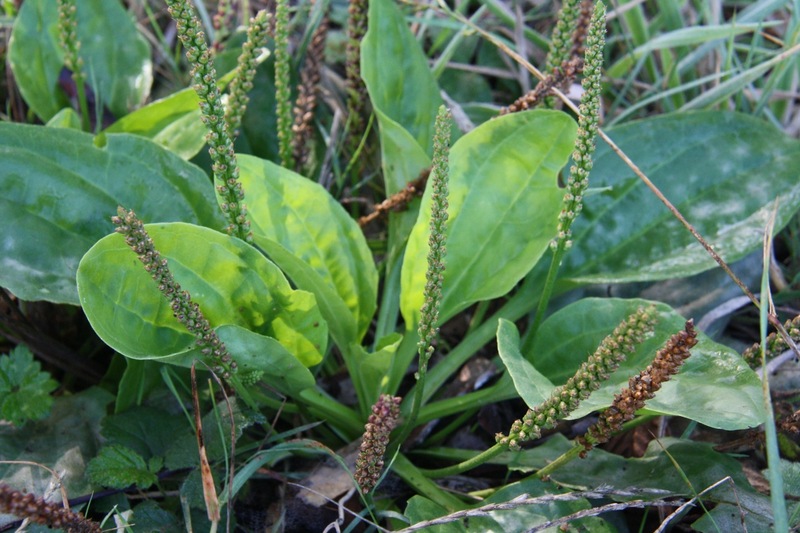 This is common plantain, or Plantago major, a European weed that you can see usually growing in wet soils. Though the leaves (and seeds) aren’t poisonous, they are tough and bitter, and not generally recommended for eating; if you want to try some, make sure they are young. However, the medicinal uses listed for common plantain are extensive. Heated leaves are used to stop bleeding and encourage tissue repair. Taken internally, it has been used to treat diarrhea, gastritis, peptic ulcers, irritable bowel syndrome, hemorrhage, hemorrhoids, cystitis, bronchitis, catarrh, sinusitis, asthma and hay fever. do you know some areas in Marin where plantain grows in abundance?